Love the hat! I bet it only came off to shower. My dad was Harbormaster in Marblehead for a while and my Mom used to knit him boiled wool mittens!! I think she knit him a hat too!! Wish I could find those mittens! Even kept the water out! The first thing I thought of was the song "They That Go Down to the Sea in Ships" . My favorite version is by Kemper Crabb. This is a picture of a real man - Captain or seaman? - a person of the sea. This fellow could have been my grandfather. He loved to fish. His boat was moored in Branford, the next town over from this photo. He had wool caps that went over his ears, though. Although he worked on land, he had been on the water just about his entire life. He was a true master. He knew everything about his boat and motor, much about how to read weather, where the fish were biting best, how to read a nautical chart and set a course via compass, how to tie the correct knot for the application, how to turn a boat into a swell, and all kinds of other cool marine-related stuff. Over my desk hangs a picture of my grandfather and me, on the water, sitting at the back of the boat. I was probably 10- or 11-years-old, and he is showing me how to bait a hook. My father took the photo. 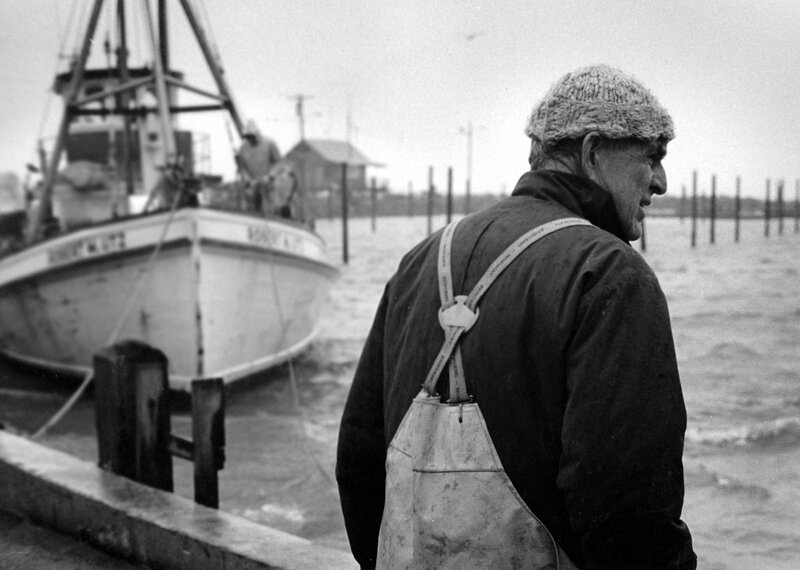 I remember it as one of the very best days of my life: my father, grandfather and me out on the Sound, fishing and enjoying each other’s company in a beautiful, salt water setting.